End of Summer: We’ve Rebounded! I hope you and your family are enjoying the last days of a beautiful summer! My family and I have enjoyed lots of time together, making memories. Last week, I spent some time working in the office; digging through data on market trends. Our last trend letters went out in the spring and since then, the market has really shown some growth! As you probably already know, I added Emily Stanford to my staff last fall. We have been keeping up a nice pace of listings and sales for 2017. I enjoy working with her and teaching her the details of this crazy business. Many of you have worked with Emily this year and I believe you would all agree she is a fantastic addition to my office. It’s always fun to have aPhD around the office who is completely into data, and FULL of questions! So, without further ado; our current assessment of the market. The economic indicators and the apparent consumer confidence show movement of the financial and real estate markets in a strong andpositive direction. 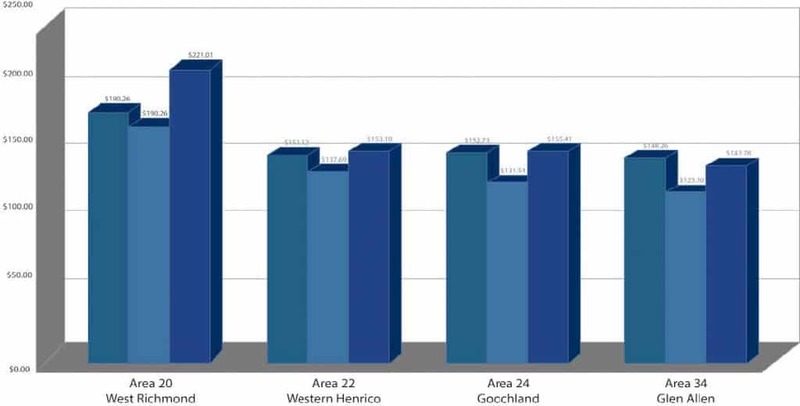 By my calculations the markets of West Richmond, Western Henrico, Goochland and Glen Allen have recovered all, or nearly all, of the ground lost in home values during the 2008-2012 market recession. That means according to averages, the market values for homes in our area are now at historic levels! How did I come up with this information? I based my position on information from the Central Virginia MLS system. I pulled the same data sample from each real estate zone 20-West Richmond, 22-West Henrico, 24- Goochland and 34-Glen Allen. Hanover’s market is healing, but not quite back to comparable levels. My data sample:Included are all home sales priced from $300,000 to $600,000, closed May 1 to July 31 of each respective year. I pulled the sales data for 2007 (the recognized market all-time-high), for 2011 (the recognized market bottom), and for 2017. The most stable statistic for reliably measuring market value is Average Cost Per Square Foot. The big takeaway from this information is that we have covered a lot of ground in the past 10 years, but we are now healed up and ready for a dynamic market going forward. Please call me to discuss the statistics for your particular home and neighborhood. As always, I greatly appreciate the kind words of referral and recommendation. Let me know if I can help with any home advice needs you may have. I have a great referral network oftradespeople and professionals that I’m happy to share with my clients.